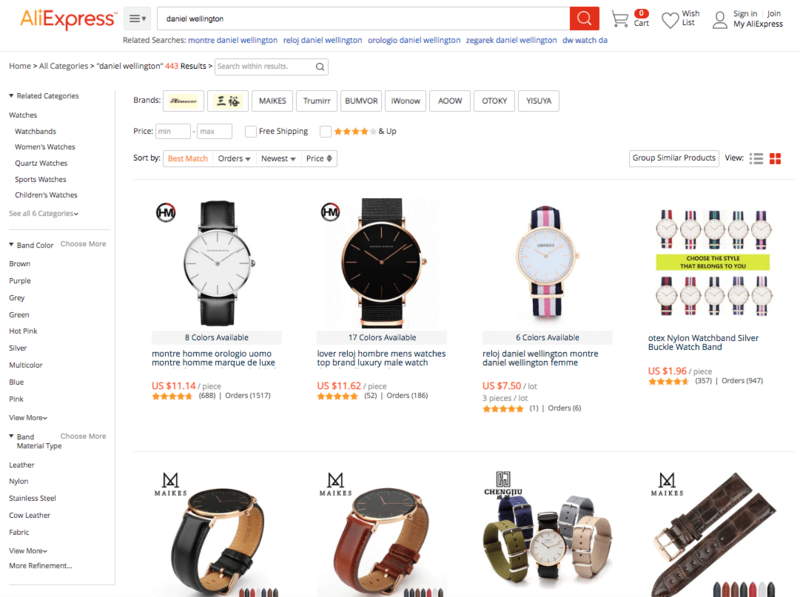 You probably will realize you are not able to big-name brands on the Aliexpress.com. This is due primarily to the fact that high-quality replicas by Chinese manufacturers cannot use the original brand-name for violating the law on protecting the rights of the trademarks. In this post, we have tried to collect your favorite brands as well as the short codes of one used by vendors to simplify your search for Aliexpress Brands and Replicas. This 2019 we have been snopping on Aliexpress for some of the best Aliexpress Dupes. Whether it is for Gucci Shoes, Chanel Bags, Louis Vuitton…we have picked some of the best knockoffs. Below is a great list for clothing, bags and jewelry. Hope this list brings you awesome finds. Reformation Puff Sleeve Lace Up Blouse – Link -Very Parisian. ACW Joggers – Link – Not sure how accurate these are but seem promising. UNIF Kiko Butterfly Dress – Link to shop – Most UNIF dupes are true to the brand. Super cute and 90’s. WRZS Unique Store – Link – Huge selection of fall clothing. The store seems to specialize in coats. Givenchy Hoodie – Link – Not ultra familiar with Givenchy clothing but has 5-star reviews. Bebobson’s Playful Store – Link – Weird, wonderful, whimsical clothing. Branded feel. Ruffled Turtlenecks/Mocknecks – Link – On trend and perfect for layering. Lux Looking Unbranded Cardholder – Link. Probably perfect for small Christmas gifts or that subtle flex as the quilting seems awesome. Gucci-inspired Wallets – Link – Come in cute colorways, don’t have proper Gs but that probably explains the super low price. $7 steal. Shrimps Antonia Pearl handbag link – looks like something an 8yr flower girl would wear down the aisle. follow ur dreams. Leopard Acrylic handbag — since animal prints are back in..
Leather Jacket Looking Clutch — link this is cute haha. Crossbody pouch bag — This looks rly familiar just can’t figure out which one this is. Malachite & MoP popsicle necklace — link – this one is cute! The best way we use to find brand is by searching on the short names. Take an example when I search “Daniel Wellington”, the results are not fantastic. As shown below, most of the items shown are straps. The trick here is to use “DW Brand”. DW= Daniel Wellington. Access Here. You might be able to land yourself good deals. AliExpress has a section called Featured Brands where you can find some incredible discounts of great products. 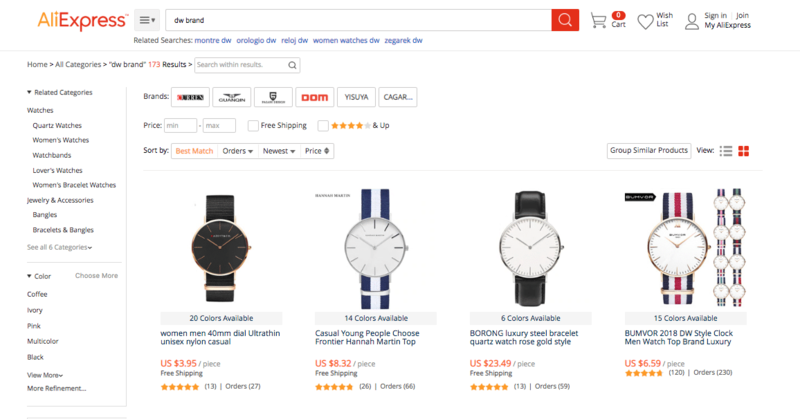 However, they are usually Chinese branded products, great brands are slowly coming into Aliexpress too. # We shall update information from time to time. (Aliexpress vendors change their searches and products frequently) So please bear with us and do come back to check for more updates. # Sellers don’t show the branding/logos to avoid being taken down/deleted they actually encourage you to email them for photos.